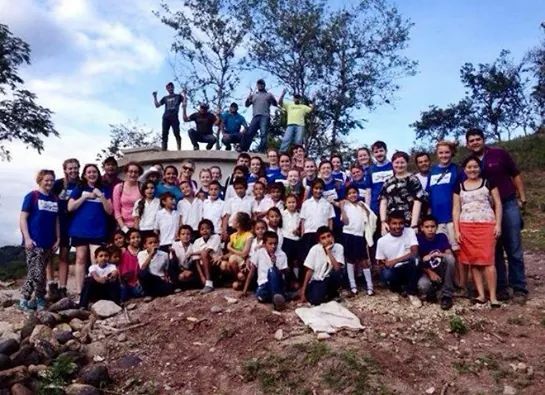 During reading week I was part of a water and public health brigade to Honduras with Global Brigades. This is a country like you cannot imagine. A country where the sky opens up for months on end to wash the land clean, then the sun bakes the mud and from this baked mud they make adobe houses to live in. These are mud huts with mud floors and battered doors, where wasps and flies burrow into the brickwork to make their home in each house. And the red soils seep into the rivers so it seems like the whole country is bleeding out. Which it is. This is a country with the ability to create life but without the means to sustain it. The whole country is crying out for clean water. The average income is three dollars a week per family, which forces people to take out loans to create water systems like the one we were lucky enough to finish, so that the first thing their children do every morning isn’t walk to the nearest stream to gather ten gallons of dirty water. This is a country where a little is a lot to almost the entire population. And they even offer what little they have to you when you enter their homes. The children don’t care that we don’t speak their language, they still want to play and sing and hold hands with us. The only reward they could offer us was gods blessing. And then we return home, with the burden of white guilt lifted from our group momentarily and we talk about all the good things we did until our friends are bored of our stories because they can’t relate. They don’t know what it’s like to have no toilets or floors or clean water. And neither did we, to be honest. Volunteering on this brigade was hard work (it’s really tough mixing cement in 40 degree heat), but it is the best thing I ever did, in college or otherwise. While the fundraising may seem daunting, just think about the end result.